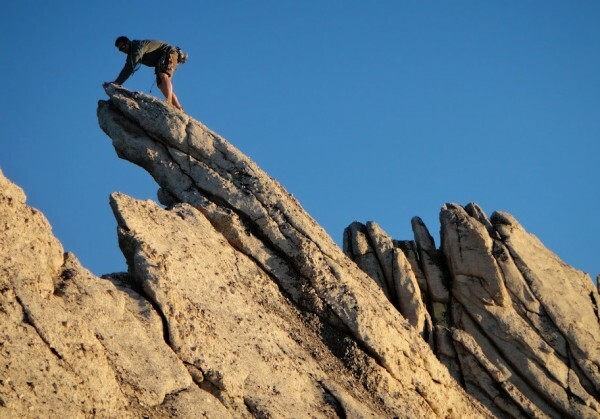 Matthes Crest is pure Type 1 fun and a must-do for anyone climbing in the Sierra. The northern section is even better than the more popular southern section, although it is much more serious climbing and only appropriate for strong 5.8 leaders. This applies to both climbers as the climbing is often as serious for the follower as the leader. In 2010 I did the standard S-N Traverse as one of my first III, 5.7 climbs. In 2011 I returned and did the full traverse as my first Grade IV climb. Both trips were incredibly fun outings on perfect rock and under perfect weather conditions, and between the two trips I pretty well captured the experience of the ridge. For those that like surprises, beware the beta dump, but for the rest, enjoy the long photo trip report! I did this climb with Edward Lau, who I was introduced to via my friends Daniel Honneger & Mike Shen. It was yet another one of those climbs where I drove overnight and started hiking without sleep! Needless to say, I slept well this night. Despite carrying the rope and rack, I kept finding myself ahead of Eddy, so I entertained myself taking pictures of the foliage. At last we were at the base of Matthes Crest, and we scrambled up the chute to the saddle in the ridge before the main headwall. The headwall isn't too hard, but it is very steep. We pitched out the standard SuperTopo line for 3 pitches before we felt comfortable simul-climbing. Edward leading the first pitch of the headwall. Note the other climber to the left. Another team later climbed in parallel to the right, so there are many ways to go here! While the climbing was very easy and the rock was amazingly solid and clean, the route is very exposed, and we didn't know when it might get more difficult, so we decided to simul-climb instead of roping up. I used running natural pro and as a result managed to cover the 1/3 mile section of ridge with the set & a half of cams and nuts that I brought, using most of the gear on the 5.2 downclimb to protect Eddy for following. Interestingly, because we were less timid simul-climbing than soloing, we caught up to some soloists, and mostly kept up with them throughout the route. Bradley & Stefan on the ridge. They were a separate party that we kept running into on the ridge. Bradley & Stefan on the Fin. The Fin. Definitely the highlight of the south ridge traverse. The fin was really fun. There was no pro, and the fin was very narrow (about as wide as a chair or less), but there were lots of feature to grab and edge on, and it reclined at a nice 45-50 degree angle. Falling would be serious even with a rope, but you could remain secure, and it was thrilling to be on such a long, narrow spine of rock! Although the SuperTopo topo shows a 5.6 traverse to the left of the fin, I don't see why anyone would take that way if they new about this! Echo Peaks & Matthes Crest dotted with climbers. One is on the summit of Matthes Crest. Is this knife-edged enough? Eddy is following on exposed but very easy terrain. At the notch after the 5.2 downclimb, just before the crux 5.7 pitch to gain the N summit. The downclimb gets a lot more exposed and a bit tricky, so the follower might want more protection here than elsewhere on the ridge. There are few features to drape the rope around, so save some cams for protecting the follower on this section. The ledge at the notch is a very comfy place to take a lunch break. I didn't care too much for the 5.7 pitch. It was very thin and balancy, with thin pro at your feet. It seemed like if you fell you would likely hit the ledge beneath (actually, on the next visit, a guy took a fall here, his last nut popped, and he hit the ledge before the next piece engaged. Fortunately it was mostly his pride that was hurt, and we belayed his party up after us). Perhaps part of that feeling was because I was climbing with a pack on, and this pitch is made a LOT harder with weight pulling you out from the wall. I found it much more doable after I ditched the pack (note that the rappels take you by the ledge beneath this section, so you can leave your pack there if you're not continuing to the N Ridge). Most people only traverse to the summit, and then descend via two 50m rappels. This is an expedient way off, but it misses out on the best part of the crest! The next year, after I had gotten stronger at leading, I returned to attempt the northern section.